My Labor Day not-quilting spree started from a desire to finish this quilt top. Originally, I had hoped to finish the piecing and baste it together with the backing and batting, but it was not to be. The quilt top that started this all was the kitty cat quilt. 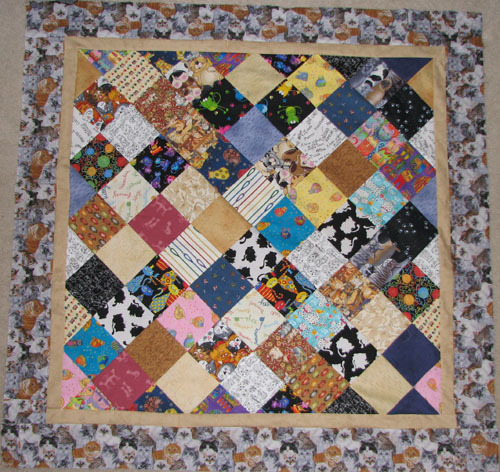 It started with 72 squares of 36 fabrics, either with a cat pattern, or something related (like mice, or fishbones). The squares were assembled into a 6 by 12 rectangle, then cut into one large and two smaller triangles, and rearranged into a square set on the bias. At the start of this weekend, I had my 6 by 12 rectangle. By Sunday, I had rearranged it into the square you see above, and added the border. This quilt top has not been pin basted yet, because I don’t have a big enough piece of batting. Since this quilt top is about 49″ square, I’m going to either have to cut down a much larger piece of batting, or piece together a few smaller pieces. This entry was posted on September 7, 2010 at 7:30 pm and is filed under quilt, UFOs. You can follow any responses to this entry through the RSS 2.0 feed. You can leave a response, or trackback from your own site.